All you need is you and the Dark Moon. On the night of the Dark Moon, as late as you can possibly stay awake, stand outside and breathe in the blackness of the night. It is Hecate’s night, the Crone Goddess has covered you in her blanket and given you the time to consider all those things in your life that you no longer need. You are safe within the womb of the Dark Goddess. Consider that which you wish to banish from your life. Take your time, allow Hecate to guide your thoughts. When you are ready, and you feel that you know exactly what must be banished turn widdershins to the East. Feel Hecate cleanse your mind of all unhealthy thoughts. Turn widdershins to the North, feel Hecate cleanse your body of all unhealthy energies. Turn widdershins to the West, feel Hecate cleanse your emotions of all that is causing you pain. 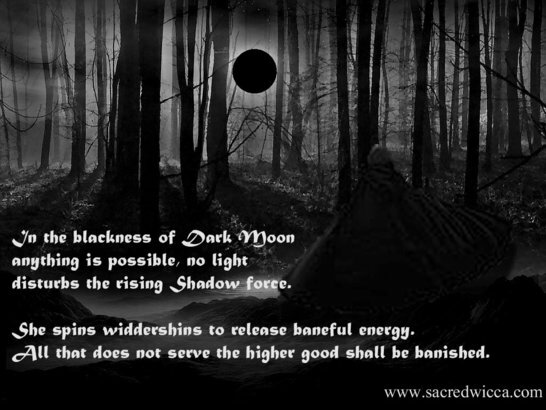 Turn widdershins to the South, feel Hecate cleanse your Spirit of all that is hindering your spiritual growth. Breathe in the darkness of the night, breathe in the regenerative power of the Dark Goddess Hecate. Know that you are cleansed and purified, ready to begin mental, physical, emotional and spiritual growth with the coming of the New Moon. It is done. So Mote it Be!